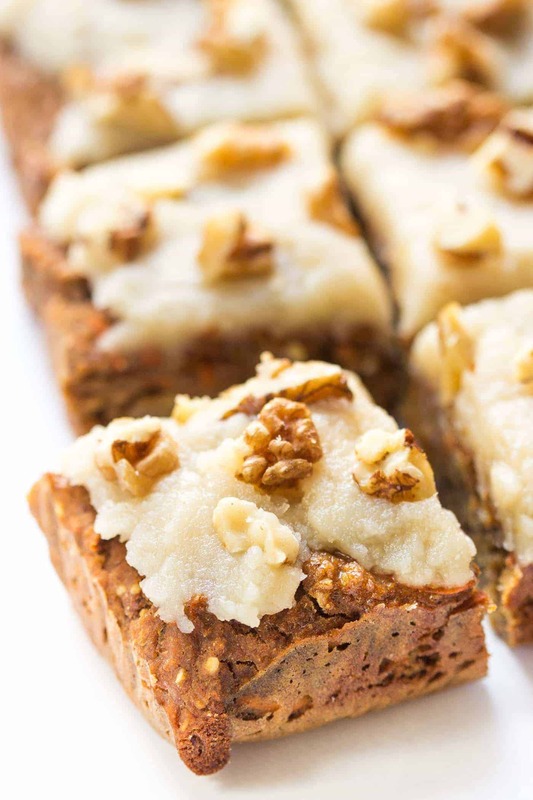 Who wants a slice of carrot cake for breakfast? Me, me, me! When it comes to breakfast, you know by now I'm all about the sweetness. Gimme a slice of cake and I'd be a happy girl, BUT breakfast is also our most important meal of the day, so I know better than to fill my belly with refined sugars and carbohydrates. Cake for breakfast = recipe for disaster. 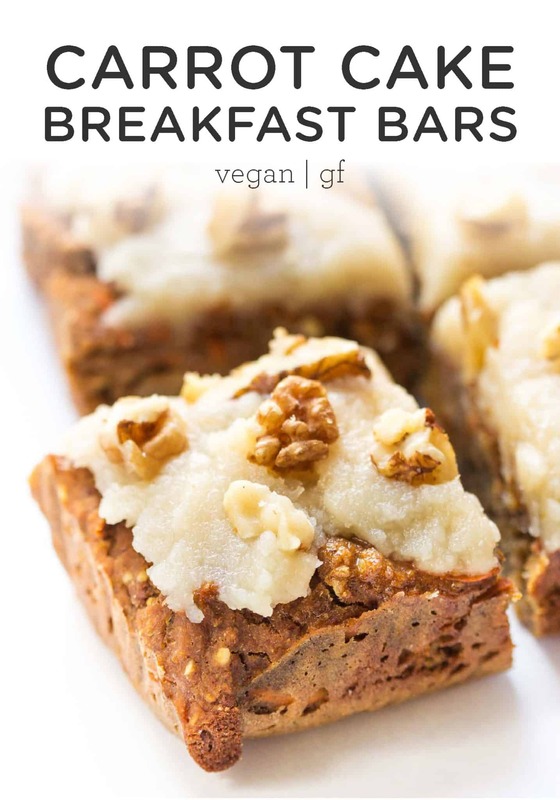 Well…unless it's vegan carrot cake comin' at ya in the form of quinoa breakfast bars! But like how can cake be healthy enough for breakfast, right? That's a valid question… because most of the time it can't. 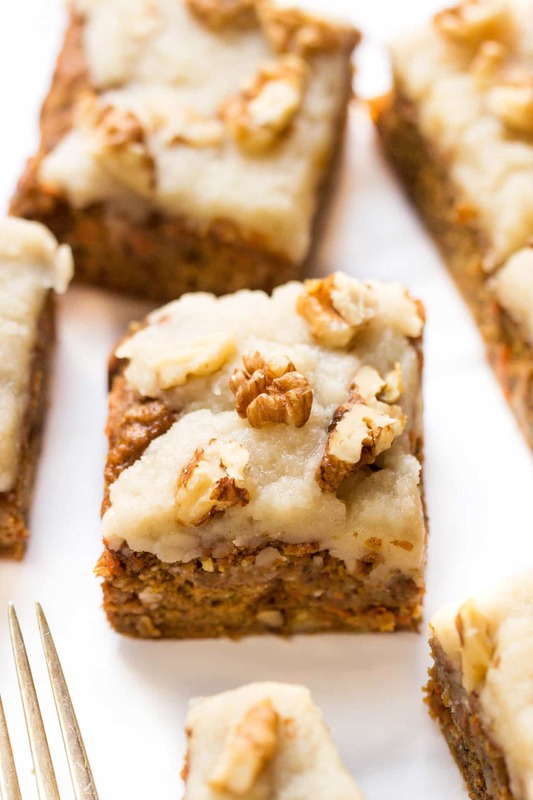 This time though, when it has ingredients like these bars do, carrot cake definitely becomes an acceptable breakfast option. 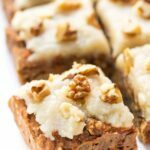 I make a few tweaks so they were a bit more carrot cake friendly, but they still have the amazingly soft and fluffy texture with a super clean ingredient list. 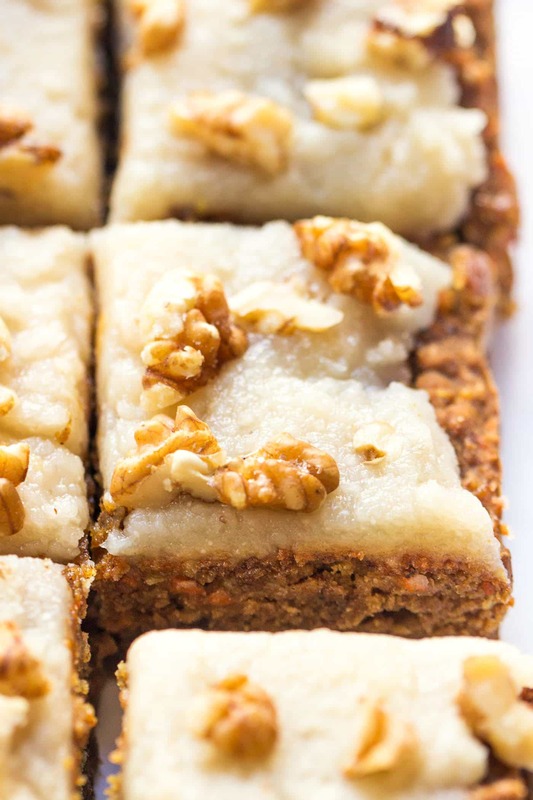 Like is it crazy to put chickpeas in your cake? And what about sweetening it with fruits and low-glycemic coconut sugar? OR what about using NO oil whatsoever? Thing is, that's how I want us to roll around here. Simple, clean, healthy and sometimes just a little surprising. 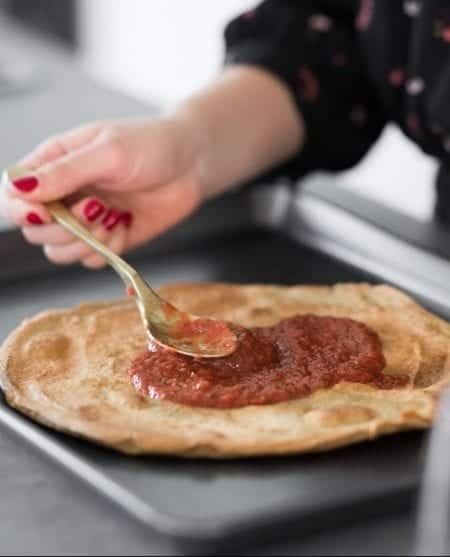 Plus, as you can see from the picture below, just because we have “different” ingredients, it certainly doesn't affect the texture at all! Mmmm it's soft, fluffy and totally cake-like! It's hard to have carrot cake without frosting, BUT I didn't want to compromise the integrity of the recipe by topping it with something that's filled with sugar. So instead, I found an amazing paleo frosting recipe that uses coconut butter! 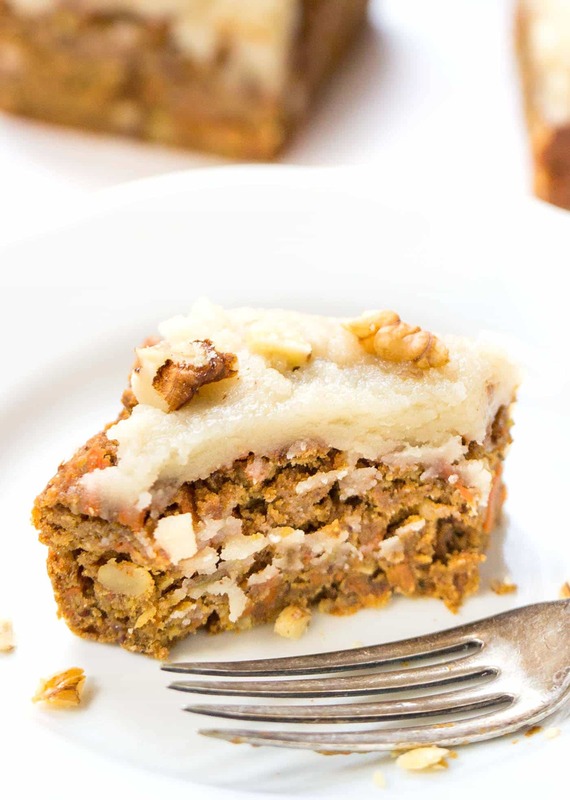 I was shocked at how creamy it was; just the perfect topping for this carrot cake. Of course, you don't have to use a frosting, it does make it a bit more decadent. But if you wanted this breakfast bar to serve as either a breakfast OR a dessert, then the frosting is totally worthwhile. I also fully stand behind the addition of the walnuts on top. So delicious! Preheat the oven to 350°F. Grease and line an 8x8 baking pan with parchment and set aside. Whisk together the flaxseed meal and water in a small bowl. Set aside for 5 minutes. Meanwhile, blend the chickpeas, banana and applesauce in a food processor until completely smooth. In a large mixing bowl, whisk together the dry ingredients, reserving the hemp hearts, carrot and walnuts. Pour the chickpea puree into the bowl along with the flax egg and mix to combine. 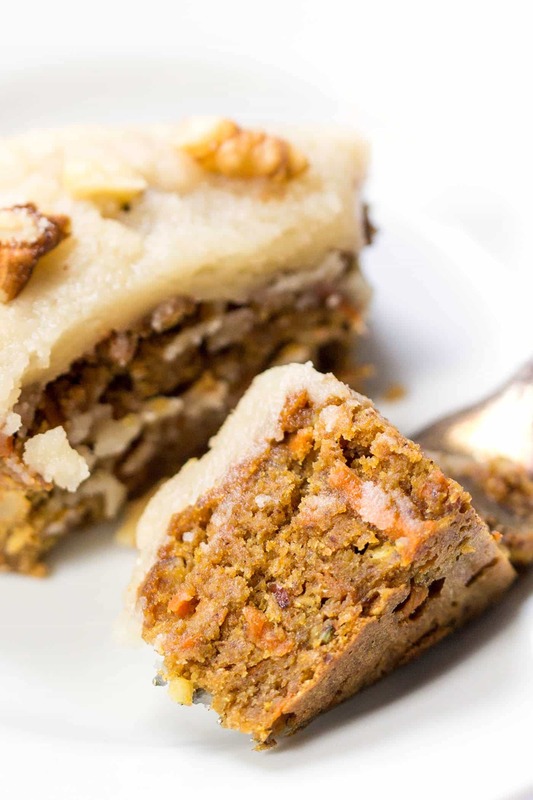 Fold in the hemp hearts, grated carrot and walnuts. Dump the batter into the prepared pan. Bake on the center rack for 22 - 26 minutes until a toothpick inserted into the center comes out clean. Let cool in the pan for 10 - 15 minutes, then transfer to a wire rack and cool completely before frosting and slicing. Slice into 12 - 16 bars. Store in an airtight container for 2 - 3 days. *If you can't find vanilla powder, substitute 1 teaspoon of vanilla extract and add the vanilla to the food processor while blending the wet ingredients. I made the cake today, but I did not had good results. Even though I am a quinoa lover I found the bitter taste really over powering, I could not taste the carrots or any other flavors. I wonder if I did something wrong. 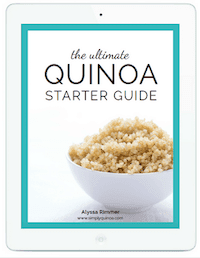 Should the quinoa flour be toasted like you mention in your guide ? If so, how do you toasts it? Hi Claudia – yes, I would definitely recommend toasting your quinoa flour if you found the flavor to be too bitter. It’s funny because some people’s taste buds are more sensitive to the bitterness, and they won’t know until they try it. So next time around, try it with toasted quinoa flour instead 🙂 Hope you enjoy them! Hello, I don’t like / est beans or chickpeas – could I sub mashed sweet potato for thé chickpeas ? Tx !!! These bars are absolutely fabulous! I didn’t make the icing but instead drizzled a bit of maple syrup. A-MAZE-ING!! YUM YUM!! You gotta try the brownies next! They’re SOOO good! hey, do you think i could substitute qunioa flour with whole wheat / spelt flour? I would go with spelt vs. whole wheat because it has less gluten and won’t affect the texture as much! I have to tell you that I made one again yesterday with LUCUMA powder OMG it’s soooo good that one piece is not enough . So great to hear you’re enjoying them! What ratio did you use with lucuma powder? I’ll have to try that! 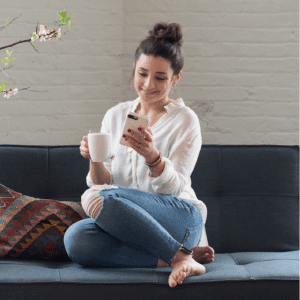 Hi there – it looks like her website is down and has been for a day or so. I would just keep checking to see if it gets back online – there’s nothing I can do on my end. Sorry about that! Yes, please! Let me know what you do. I don’t eat bananas due to their high GI, so I never have them on hand. I think you could try to substitute with 100% applesauce. Maybe add a tablespoon or two of chia seeds and let the batter rest for a bit so that it has time to come together. Hmm I’m not sure. You could try doing just applesauce, but you might want to add some chia seeds to help bind it together. Or maybe an additional flax egg and half the applesauce. Let me know what you end up doing! Can’t access the Coconut Buttercream Frosting recipe. It said page not available. It sounds delicious, so could you email me the recipe? Thanks so much! I know…so sorry! Her site is down right now, but hopefully it will be back up soon! Hi Karl – for some reason her site seems to be down at the moment and I don’t have access to the recipe either. Hopefully it will be back up soon! Is it okay if I don’t use hemp hearts. Can I substitute it for something else? You could use another nut/seed or just leave them out! My go to for the past few weeks has been egg nests. Shredded sweet potato baked in nests in cupcake pan. 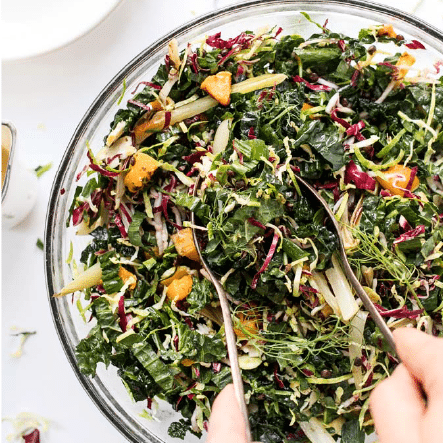 Fill nests with spinach or collard greens and then top with an egg and bake. Easy to make ahead and grab-n-go; super filling and oh so good! I am looking forward to making the carrot cake this weekend for a sweet change. Thank you for sharing this recipe! That sounds absolutely amazing! I’ve seen those floating around Pinterest but have never tried them. 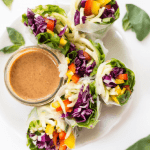 Totally gotta do it – yum! Those look great, I will have to try them out! I also have a major sweet tooth and would eat a giant decadent piece of chocolate cake or cheese cake every morning for breakfast if it was healthy. But alas, it is not. So my go-to breakfast is a bowl of oatmeal with fruit and hemp seeds on top. If I’m in a rush, then I’ll grab a few oatmeal bake muffins (either apple cinnamon or coconut lemon). These look like they’d be a nice third in-a-rush option! I hear ya girl! Your breakfast sounds lovely though – filling, satisfying and nutritious. I love the idea of the oatmeal bake muffins! How do you make those? I am excited to try this recipe but am having trouble with the link for the frosting. Sounds great. I have all the ingredients but the hemp hearts. Is there anything I can use instead?